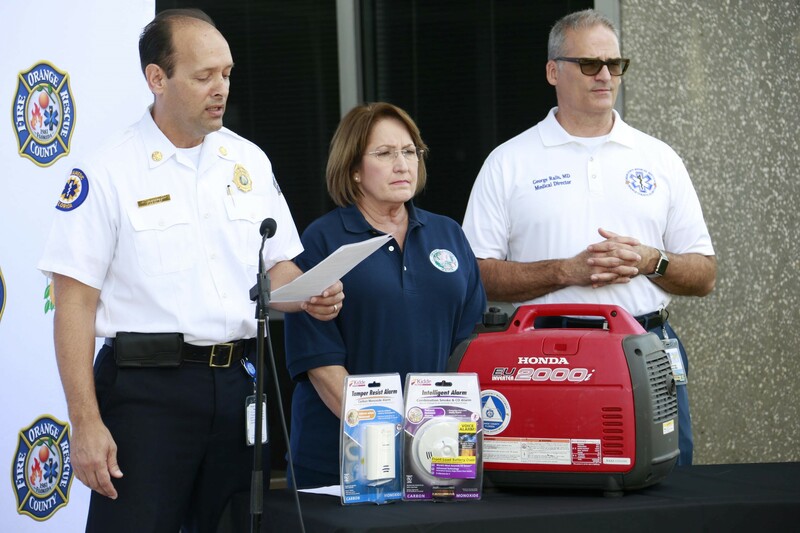 Orange County Mayor Teresa Jacobs in partnership with Orange County Fire Rescue, held a briefing on generator safety in the wake of Hurricane Irma recovery. “I was absolutely heartbroken to learn of the three deaths in Orange County resulting from carbon monoxide poisoning related to the use of an emergency generator. Every life is so deeply valued, and I can only imagine the suffering of the families who have sustained this terrible loss,” Mayor Jacobs said. Don’t assume that you are safe. Carbon monoxide fumes emitted by gasoline engines can be fatal, often without the victims – especially those who are sleeping – ever realizing the danger. You cannot smell or see carbon monoxide. So even if you do not smell exhaust fumes, you may be exposed. If you start to feel sick, dizzy, or weak while using a generator, get to fresh air immediately. The carbon monoxide from generators can rapidly lead to full incapacitation and death. If you experience serious symptoms, get medical attention right away and inform medical staff that carbon monoxide poisoning is suspected. If the symptoms occurred while indoors, call the fire department to determine if it is safe to re-enter the building. Install carbon monoxide alarms inside your home to warn when carbon monoxide levels from any source pose a serious health risk. Follow the manufacturer’s recommended placement. Never store fuel for your generator in your house. Gasoline, propane, kerosene, and other flammable liquids should be stored outside of living areas in properly labeled, non-glass safety containers. Do not store them near a fuel-burning appliance, such as a natural gas water heater in a garage. If the fuel is spilled or the container is not sealed properly, invisible vapors from the fuel can travel along the ground and be ignited by the appliance’s pilot light or by arcs from electric switches in the appliance. Before refueling the generator, turn it off and let it cool down. Gasoline spilled on hot engine parts could ignite, and invisible vapors from the fuel can travel along the ground and be ignited by the generator’s pilot light or by arcs from electric switches in the appliance.